Squaw Valley skier Travis Ganong has again been nominated to the U.S. Ski Team. The U.S. Ski Team recently announced its alpine nominations for the 2018-19 season, and once again several local athletes are on track to receive financial support and coaching from the program. Leading the way on the men’s side are a pair of Olympians in Travis Ganong and Bryce Bennett. Ganong raced for the US in the 2014 Olympics, but suffered a season-ending torn ACL last December. The Squaw Valley Ski Team member’s best result of the year came at Lake Louise, Alberta, where he finished in 16th place in super-G.
Ganong, 29, is again an A Team nomination, which means he’ll receive full financial support from the US Ski Team if selected. Another local athlete, Bennett, 25, had one of the best performances of any skier on the US men’s team during the Olympics last winter and has been given a B Team nomination. 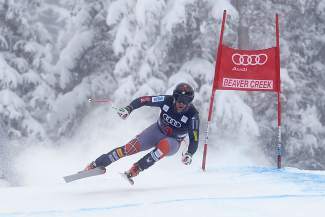 Bennett was one of America’s most consistent skiers on the International Ski Federation World Cup this past season, before taking a pair of top-20 finishes at the Olympics in combined and downhill. After storming onto the national scene last season, Carnelian Bay’s AJ Hurt, 18. received her second nomination to a U.S. Ski Team. The Squaw Valley product was a National Training Group nominee last year, and after taking a combined and giant slalom title at last March’s National Championships at Sun Valley Resort, followed by a win at the National Junior Championships in super-G, Hurt has received a B Team nomination from U.S. Ski Team. Fellow Tahoe native, Stacey Cook will return next year with a B Team nomination after missing out on a chance to compete in her fourth Olympics last winter due to a brutal crash during her last race on the International Ski Federation (FIS) World Cup tour in Garmisch-Partenkirchen, Germany. Cook, 33, skis for Mammoth Mountain Ski and Snowboard Club. This year’s Development Team will include Squaw Valley Ski Team’s Keely Cashman, of Strawberry, Calif., and Sugar Bowl Ski Team & Academy’s Ainsley Proffit, of St. Louis, Mo. Athletes accepting nominations to one of the four mens and women’s teams receive various amounts of support and funding, including access to the U.S. Ski & Snowboard Center of Excellence. The teams are broken down into four tiers, which receive a range of support depending on the skier’s experience and skill level. Other athletes nominated include Olympic champions Mikaela Shiffrin, and Lindsey Vonn. An official team announcement will be made in the fall, according to U.S. Ski & Snowboard. The 2018-19 World Cup is scheduled to begin at the end of October in Solden, Austria.